Please Help Improve Laurelin’s Quality of Life! My wife, Laurelin O’Brien, went blind before she turned 18 years old. That was in 1998 and before long she was diagnosed with multiple sclerosis (MS). Though she had flare ups, Laurelin lived life. She was able to become a licensed high school teacher and, in 2010, we learned we were pregnant. Laurelin knew that she could possibly have a bad attack due to the strain of pregnancy, but we wanted our little girl so badly that together we decided to take the risk. 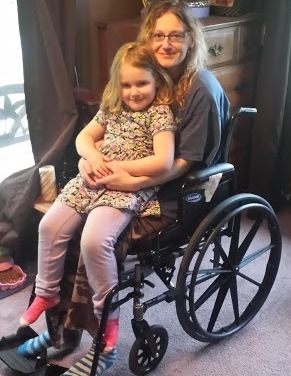 Unfortunately, when our beautiful daughter was born, Laurelin did suffer a severe MS attack leaving her partially paralyzed, unable to drive, unable to teach, and unable to be the mother she had always dreamed of being. Now, she lives in a wheelchair, unable to enjoy the simple joys all mothers dream of like playing outside, going for a walk hand in hand, helping at her child’s school or simply baking cookies together in the kitchen. Then, one day in 2015, she learned about a program in Mexico which offered stem cell treatment for her MS. This treatment has taken people in wheelchairs and allowed them to regain much of what they had lost. While stem cell treatments like the one Laurelin needs are done in other countries, only clinical trials with strict criteria are being done in the US for multiple sclerosis and insurance does not cover it either way. The cost of this treatment is $54,500. Additionally there is the expense of travel and lodging while we are there for the 28 days required to administer the treatment. Can a price be put on the quality of life? With your help, Laurelin will get her life back! 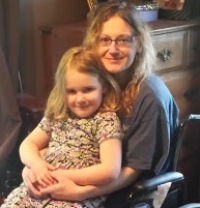 To help with the financial burden of Laurelin’s uninsured expenses, a fundraising campaign in her honor has been established with Help Hope Live, a trusted nonprofit organization that has been providing community-based fundraising guidance to patients and their families for more than 30 years. All donations are tax deductible to the full extent allowed by law, are held by Help Hope Live in the New York Catastrophic Illness Fund, and are administered by Help Hope Live for illness-related expenses only. Please consider a contribution. Keep an eye on this campaign page because we will be planning some fundraising events soon and posting updates regularly. If you’d like to volunteer to help, please call or email us. Thank you in advance for your generosity and support. We hit our goal for the treatment, and the money is sent to the clinic! Thank you all for your donations. I have increased the fundraising indicator, as we are still accepting donations for other stuff that might come up while we are down there, like MRI’s (she needs two of those that insurance won’t cover up here). Thank you all for making this happen. We wish you nothing but the best and hope this treatment gets you everything you want and more. Laurelin, this is Neal Berkey. I used to work with you at Binghamton High School. I thought that you were a nice person. I think that you remember me. Good luck. You do not know me, but we have a common friend, Barb Dufour, who obviously cares a great deal about you. I made a donation because of Facebook post by Barb. I wish you much health and success. Dewey, I loved working with you when you were substituting! I'm contributing because I KNOW you can get better and I'm cheering for you!!! As a co-worker of your mother, I have known of your tough battle with this awful disease. Keep fighting! We wish you all the best. I have known Dewey since she was in high school. She is a very brave young woman and when her benefit draws near if I am in the area, I would be happy to help. God bless you Dewey! One day at a time! Sending this from your Massachusetts cousins along with love and prayers. Best of luck in attaining your goal...and no, a price can NOT be placed upon the quality of life!! I hope to help in whatever way I can. Will help in the future to achieve the ultimate goal! Good luck! My Thoughts and Prayers continue for your successful stem-cell treatment.